Cheers, America! According to the Brewers Association’s 2017 year-end report, there are now more than 6,000 breweries nationwide — an increase of 500 breweries from just six months ago. And here’s some even better news: 98 percent of those breweries are small and independent, and 83 percent of citizens over the age of 21 now live within ten miles of a brewery. “White Lion is inching closer to securing a downtown Springfield location — watch for an announcement in early 2018,” says brewer Mike Yates. “In the meantime, we will finally be releasing an IPA in mid-January. It will be 16 ounces of not-too-hazy, Galaxy-hopped deliciousness.” Founder Ray Berry adds that White Lion looks to expand its market beyond Massachusetts in the latter part of 2018. Brewer Josh Britton plans to increase on-site capacity and production in his second year, allowing for more volume and expanded retail hours. Britton will produce more of his flagship Pomona IPA, Watershed IPA, and Cease & Desist IPA, while making his XPerimental Series a regular offering in 2018. 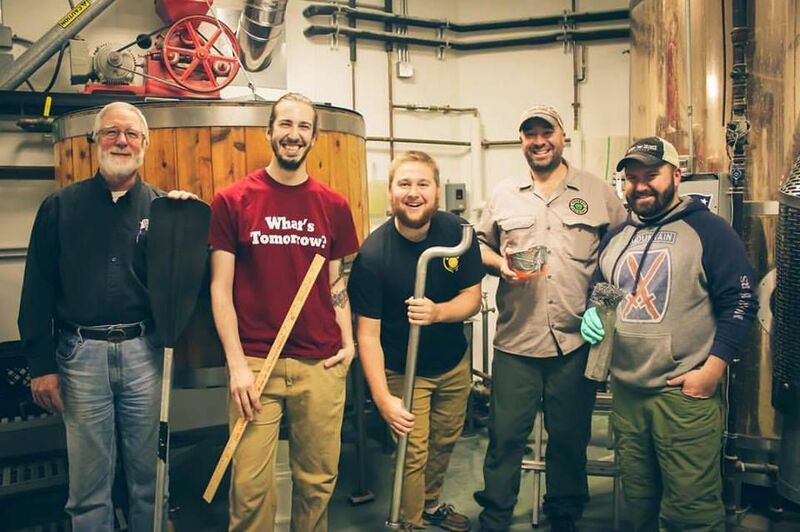 “We are super excited to continue our permanent resolutions about staying with wild local yeast, locally-sourced ingredients, and locally-sourced renewable fuels,” says brewmaster Chris Gagné. Watch for the return of the Gin Barrel Saison as well as three new beers: an oak foudre aged sour pale ale, plus two variations that employ local black currants and red currants. Eric Kerns has big goals for 2018: “Now that we’ve built a loyal community, a vibrant taproom culture, and a stable of signature beers, we’re going to be looking for more opportunities to collaborate — with chefs, artists, farmers, and other breweries, near and far.” Co-founder Orion Howard adds that this will include some distribution in the Valley. Look for an additional exciting Bright Ideas announcement on Facebook and Untappd on January 10. “We’re launching new distribution of our ginger beer in New York and California, with other regions to follow later in the year,” says head brewer Sam Dibble. “We continue to expand our experimental barrel aging program and have rum barrel-aged ginger beer and imperial stout coming soon,” with plans to can at least two New City ales by the end of February. Co-founder Nick Morin can’t be too detailed yet, but says that Iron Duke may be on the move, potentially building out a new facility. “We plan on continuing to experiment with a lot of small-batch stuff,” he says. “We try to have at least one or two sour beers on tap, as well as one or more barrel-aged offerings. Having successfully launched their brewery in October, brothers Joe and Nick Cocchi are now planning live music and a crowler machine for the taproom, plus a spring food truck festival, seasonal beer releases (next: an oatmeal stout), increased taproom hours, and Tin Bridge beer on tap at a few local restaurants and bars. Big Elm had a great 2017 by expanding across the state, says brewer Bill Heaton. During mud season, the brewery will release a one-off batch of Czech-style pilsner. “We are also going to package our ever-popular English style amber, Lion’s Ale, in 16-ounce cans for year-round distribution.” At a taproom party on March 3, Big Elm will release a small batch of its bourbon barrel-aged imperial stout, called The Undead of Winter. “Most of our ambitions for 2018 involve growing the distilling end of our business,” says co-owner Dan Kramer. “Currently we are only selling our spirits in our tap room, but we hope to roll out limited distribution to select restaurants and bars as well as a few package stores.” Element will release more 500mL beer bottles as well, the first being LESO, a variation on its Extra Special Oak recipe that is dry-hopped with lavender. Having just opened December 1, Drunken Rabbit has been busy with a successful launch. Looking into 2018, the brewery plans to think outside and box and help beer lovers expand their palates by providing surprising flavor combinations with new recipes. “In 2018, Honest Weight will focus on expanding our barrel program,” says co-owner and brewer Sean Nolan, “and will continue to bottle and release new beers throughout the year,” including Gate 37 (a buckwheat grisette bottle conditioned with Brettanomyces), A Pattern Language (an aged sour farmhouse ale with plums and Brett), and Epistrophy (a mixed-culture strong dark saison with local honey, aged in bourbon barrels). Brew Practitioners has added a canning line and has also begun to distribute draft beer, with a custom brew coming to the Lord Jeffery Inn in early 2018, says general manager Tanzi Cannon-Eckerle. Spring will also bring a revamped Brew Bus program, and the brewery’s first non-alcoholic beers, gluten-free beers, and a surprise frozen drink for the patio come summer. “We are adding some barrel aging to our portfolio,” says brewer Rich Pedersen, “with a bourbon barrel-aged imperial stout.” He adds that Hitchcock self-distributes in Franklin, Hampshire and Berkshire counties, but has added a staffer and recently signed on with a distribution company to get their beers to Hampden County and out to the Cape and Islands. Brewer Chris Post is planning a expanded taproom with a new beer garden and extended hours. “But we’ll continue to operate primarily as a production brewery,” he says, making more small-batch beers via the yeast bank he’s developing with Bright Ideas Brewing and the Massachusetts College of Liberal Arts in North Adams, as well as expanding his canning to include more seasonal lines and a greater self-distribution area in the Valley. Building 8 has kept its beer lineup to just three recipes since it opened in September 2015, but those three IPAs have proved to be regional hits. That’s why the brewery has added two more fermenters, says head brewer Mike Yates, which will increase capacity by 50 percent, up to 2,200 barrels per year.